This firearm simulator from the Rings Blue Gun series is an accurately molded, highly detailed replica of the CZ 75 semi-automatic pistol, as used by law enforcement agencies around the world. Designed for use in police and military training, its rugged, inert urethane build makes it difficult to damage and safe to use, even for the least experience trainees. 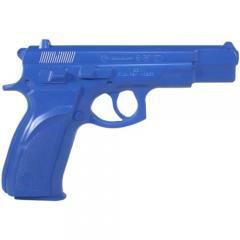 Its bright blue color prevents it from being mistaken for a working firearm. The simulator is also available in a weighted version that provides additional realism during firearm handling drills and other training activities. Canadian Badge - B703 - 2 1/8" x 3 1/2"